Jenny (our guide) eating in her favorite restaurant she took us too. 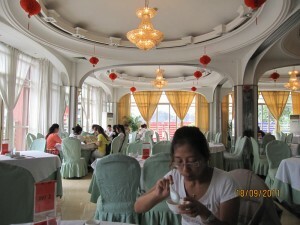 This is a photo of Jenny eating with us in her favorite family restaurant in Hangzhou. Zina and I had a beautiful meal. Hangzhou is generally cheaper than Shanghai in most respects. I’d say than Hangzhou is certainly very beautiful, and remember this comes from someone who lives in New Zealand. If you know me you know that I love tea. Hangzhou is the most famous place in China for the production of green tea. 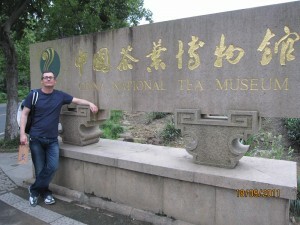 In fact, the Chinese National Tea Museum is located in the city. 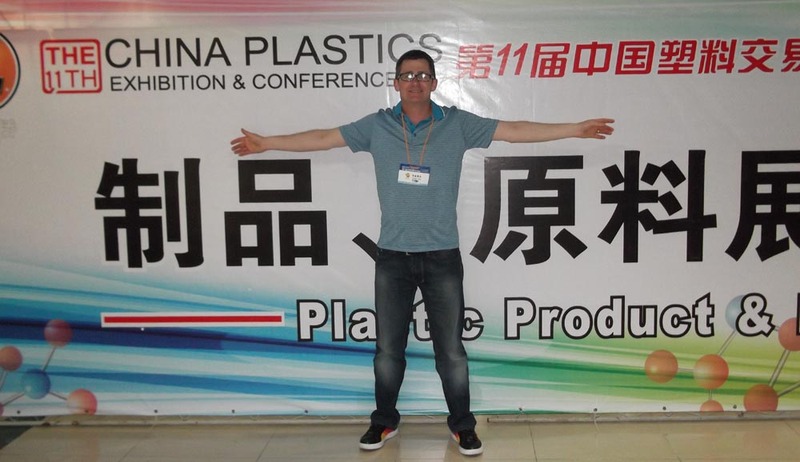 You see, China is such a huge country it has the opportunity to have some of the most obscure of all things well represented in a grand scale. Last time I was in Shanghai for instance, I visited the Museum of Patriotic Communist Posters. So don’t be surprised there is a National Tea Museum. Sadly, we found out tonight the Barbie Doll Museum had closed (shame). Anyway, I digress and I’m not up to Shanghai yet. 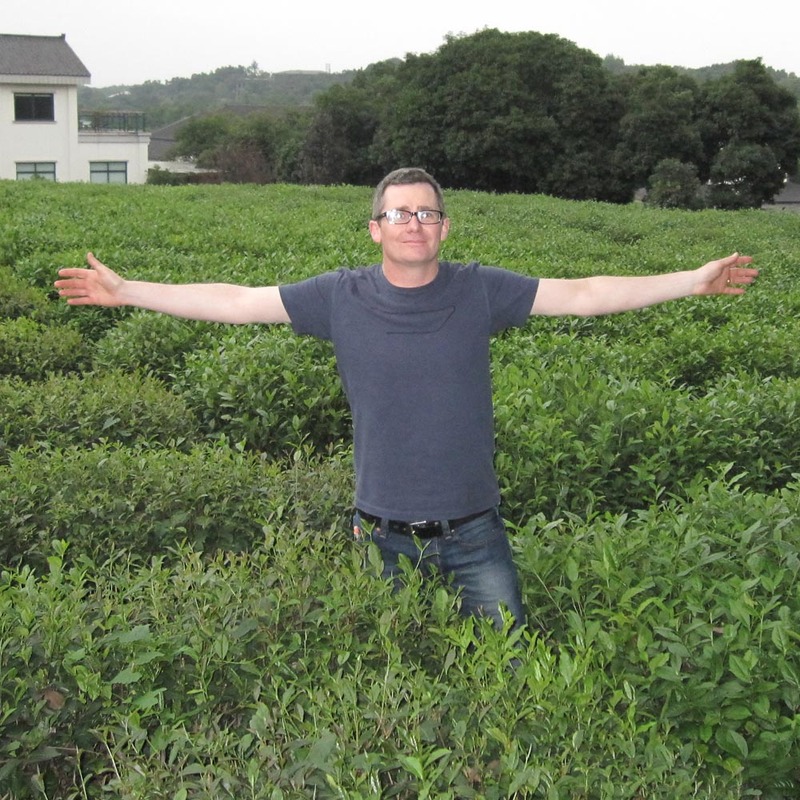 Norman visits green tea plantation near the Chinese National Tea Museum Hangzhou. The wonderful thing about China is that most of the museums are free, although there is heavy pressure (well not that heavy) to buy things in the shop. I was so overcome with excitement from my visit to the museum I spent $50 on a box of green tea leaves. The private tea tasting ceremony was totally cool (I’m a hip person you see and I know what cool is I can tell you). Hangzhou also has the National Silk Museum. Probably not as cool as the tea museum for me, but other people will be the opposite. Hangzhou is probably most famous for the lakes in the area. The city is built on one side of the West Lake. The area took my breath away with regard to how beautifully integrated the lake, parks and city were. Almost like a giant bonsai diorama but on a city scale. The Chinese saying goes that you meet a woman in xyz province, you eat in Canton, live in Hangzhou and die in some province that makes good coffins (I know I’m great at mutilating Chinese proverbs, but you get the gist). 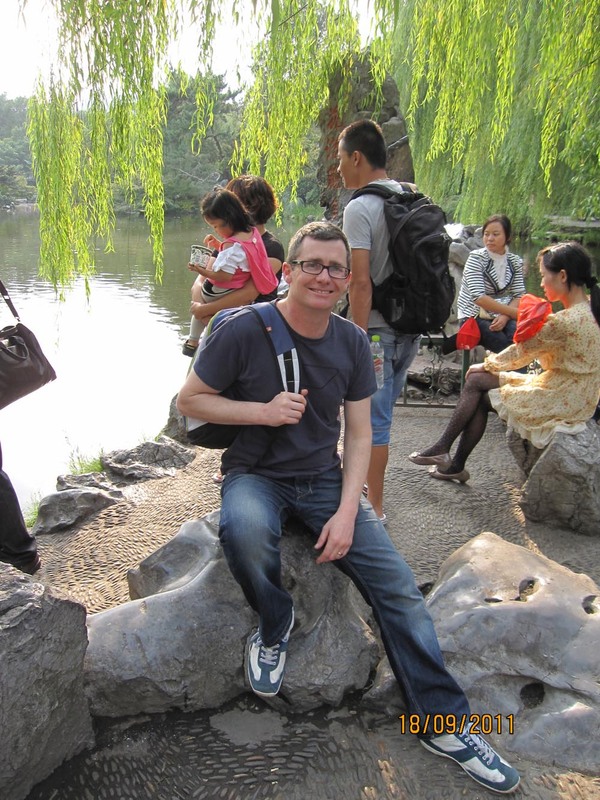 Now this post is getting to be a bit like a Lonely Planet like guide to Hangzhou. So I better get more interesting. Norman explores the giant bonsai like city of Hangzhou sits on a rock by West Lake. 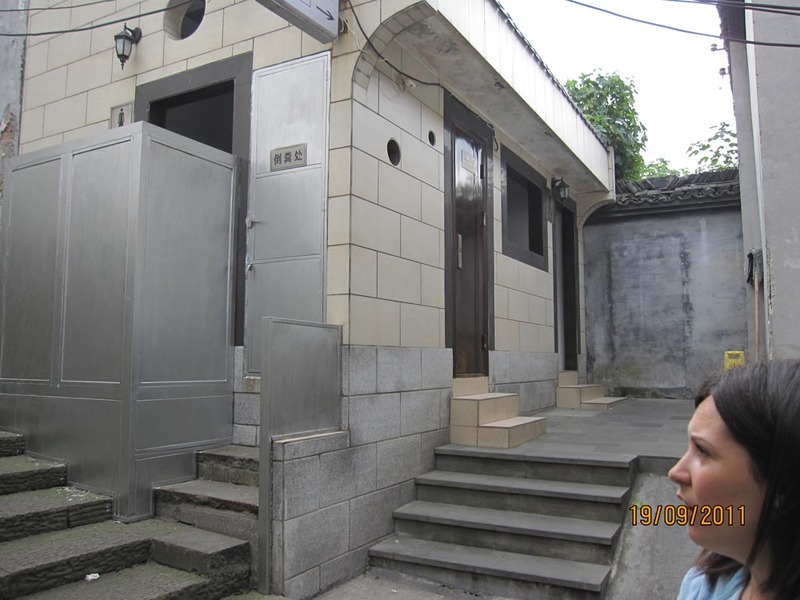 So here are a couple of pictures of public toilets, which are probably on a general level the best I’ve seen anywhere in the world, this also goes for the ones I discovered in Shanghai. Zina looks approvingly at the public toilets of Hangzhou. Clean, plenty of them, no graffiti. The ones in New Zealand are barbaric in comparison, and many of the people that use them are even more barbaric, what with the mess they leave behind and the damage they do to their community’s facilities, scumbags we have (cats and dogs are cleaner than some of our people). Thinking about public toilets, I wonder what they are like in Dunedin’s new stadium. 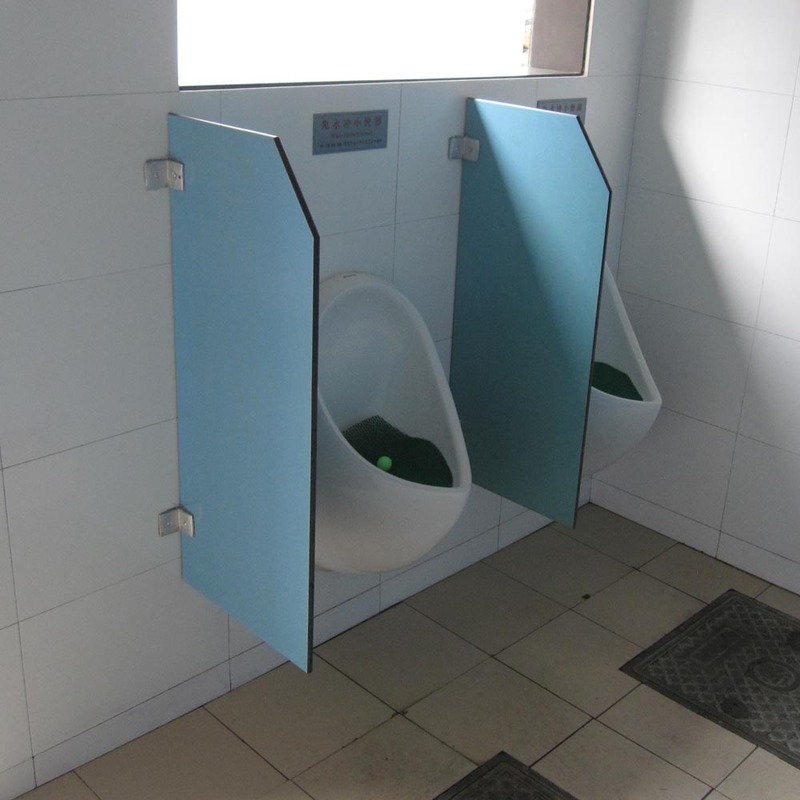 It is one of the few things I didn’t like about the old stadium, too few toilets so that people were left with no other option but to urinate against the walls and on the pathways, like I said, barbaric, but in that case it was the institution that had forced it on the public. I’d find it very ironic if the new stadium was no better. The interior of a mens public toilet. No graffiti, very clean, no smells, plenty of them, no waiting. Unlike the dirty versions in New Zealand. After Hangzhou we caught the train to Shanghai. Probably about the same distance between Christchurch and Dunedin, but being such a developed country the distance was no issue when you are travelling at nearly 300 kilometers per hour. We went first class and the cost was 150 Yuan ($29NZD, $23USD) and took just over an hour. 2nd class was about 90 Yuan, but don’t think this is back with the chickens, visions of people hanging off the side or sitting on the roof of the train, in fact, next time I’ll probably travel 2nd, there didn’t seem to be much difference. The seating was similar to an aeroplane just more space both in 1st and 2nd. It was a shame we traveled at night, the countryside looked very interesting and certainly still very densely populated with lots of market gardens. The Chinese are building the fastest most advanced and largest rail network in the world. This isn’t the fastest or most advanced train. Last time I was in Shanghai I took the Maglev train to the city centre from the international airport, Maglev being Magnetic Levitation I’d imagine. The train arrives some distance from the centre of Shanghai so there is a need to get another form of transport. We used a taxi, and unlike our arrival in Hangzhou we swatted scalpers. It took about 30 minutes to the city centre and cost 80 Yuan ($15NZD, $12USD). It was fascinating watching the speed climb as we departed. We were certainly very happy to arrive at the Broadway Mansions Hotel which is just north of The Bund, next to the Russian Consulate, Zina seem overjoyed and excited when I pointed this fact out, well actually she looked at me as if… well just as if. I’d recommend getting a river view room, I chose city view thinking it would be looking out over Pudong, but it was just out over non discript urban sprawl. 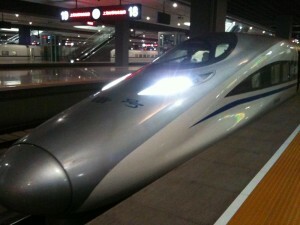 Our fast train arrives in Shanghai station from Hangzhou. At this point we catch a taxi to our hotel in The Bund area. That night craving some Western food like philistines we went on the hunt for some KFC (yes I know). Zina got some Subway and I got a lovely berry smoothy come slushy thing. We walked along The Bund that is the old Art Deco financial district across the river from the new financial district called Pudong (means East of the River). Both sides are probably best viewed from their opposing bank of the river to appreciate how dramatic each is, either the new or the old. As usual, no scumbags and miscreants on the street. Tomorrow I’ll talk more about our travels in Shanghai. Also I have my meetings at the New Zealand consulate and also the Shanghai Chamber of Commerce. I’ll leave you with a taste of what is to come. 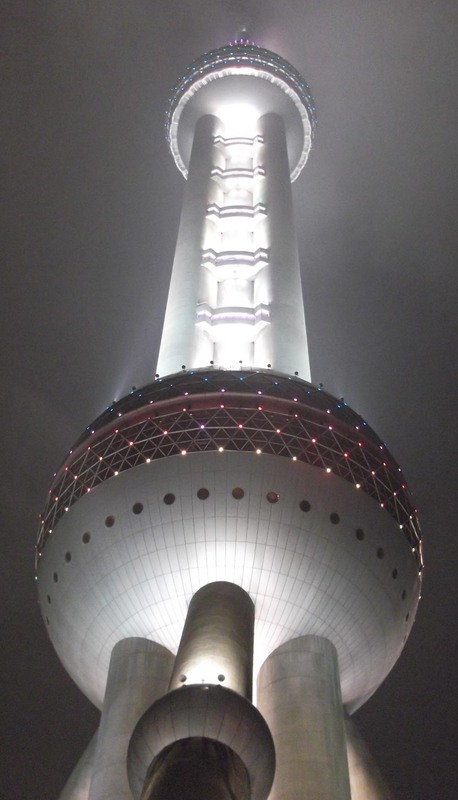 Actually this is a view from the bottom of the Shanghai tower on a misty night. Remember all these photographs are taken by moi. wow, amazing stuff. keep it coming norman! Next post: Mao’s Little Red Book and Pink Puffer Jackets.